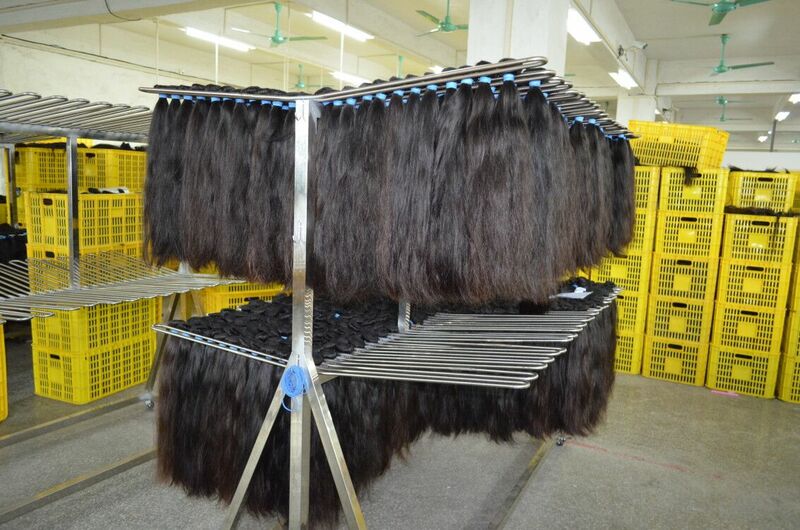 For the words of raw material, because we purchase the hair from the original country, like the Brazilian are cut from the Brazilian girls.All our hair are virgin human hair, there's a way can tell the mixed hair and truly virgin human hair. The mixed hair after dyed, you will find some pieces hair can not dyed and still stay black, but our hair can be dyed any color you like, and mixed hair after used for weeks ago, you will find it is easy get tangle or shed, but our 5A Brazilian hair can be kept for more than 2 years lasting. 1. Raw material selecting) for the production process . I never knew that human hair was a material. Is the hair a mix blend and of real hair and fake hair, not 100% off a human head? In proces(They are completely washing and caring) what are the doing to the hair to care for it beside shampooing and conditioning it? A:When washing your hair, make sure to first brush it thoroughly with a paddle brush to ensure that strands are free-flowing. This will unwind the waves somewhat, but you will be able to bring them back using a curling iron or bendy rollers. Make sure you use a pre-conditioning treatment before shampooing in order to reduce drying of the hair. Q:What is weaving head combing process? Finally,when we get the hair, we will make it for hair wefts(When the hair cut from the girls, it named hair bulk, hair weft have hair weft head, so you can installed it, that's the difference with hair bulk and hair weft). During this process, we do not mixed any other thing in the hair, the hair qualities is large, it will have some good quality hair and unqualified hair, we will choose good quality hair to assure our hair quality, so we named this process as Raw material selecting.